happen to the rest of the world"
"The term “Black” as used in Black Quantum Futurism is not only referring to skin pigmentation, race, lineage, and cultural identity. The concept of “Black” in BQF encompasses each of those complicated phenomenon, but it also refers to the Blackness that permeates deep space, what is commonly known as “dark matter.” It encompasses the Blackness or darkness that permeates mental space and inner space at the speed of darkness which surpasses that of light by not needing to move at all." What is Black Quantum Futurism? ​"Black Quantum Futurism (BQF) is a new approach to living and experiencing reality by way of the manipulation of space-time in order to see into possible futures and/or collapse space-time into a desired future in order to bring about that future’s reality. This vision and practice derives its facets, tenets, and qualities from quantum physics, futurist traditions, and Black/African cultural traditions of consciousness, time, and space. At the point where these three traditions collide exists a creative plane that allows for the ability of Africandescended people to actually see “into,” create, or choose the impending future." "Futurism, alternatively known as futurology and future studies, refers to the act of theorizing or envisioning possible, probable, and preferable future(s). Much in the way that historical studies seeks to tell stories of the past (or some approximation to the past, as experienced by a privileged few), futurism attempts to not only envision what is to come, but to understand what about the world is likely to continue, and what about the world could plausibly change. Futurism seeks a systematic and pattern-based understanding of past and present, and to determine the likelihood of future events and trends. The most relevant practice and theory of “futurism” for the purposes of BQF Theory and Practice is Afrofuturism. Afrofuturistic concepts of sci-fi, fantasy, myth, and speculation bind both the past and future, delivering them to a Now in visual, literary, musical terms (and any other mode of expression that one sees fit to attach the Afrofuturistic lens to). Afrofuturism is visionary and retrospective and current all at once, in that it recognizes that time cycles, spirals, or can be experienced in many other shapes, and at varying rates." 'Black Panther: The Album' Is Kendrick Lamar's Parallel, Pan-African Universe"
​of Spirituality and Practice. Originally published in S&P. What is a nation? What values does it stand for? Is it possible in this day and age for a country to be isolationist, ignoring the challenges and the needs of the rest of the world? Do powerful and rich countries have a responsibility to help others? Should the resources and intellectual talent of the nation's best and brightest be used to craft solutions to problems or to build bigger and better weapons? Is it ethical to engage in arms sales? Are those who arm the oppressed seeking justice or creating havoc? These are not the kinds of questions you'd expect to ask after seeing a Marvel superhero movie. But they are driving forces in Black Panther, directed by Ryan Coogler from a script he wrote with Joe Robert Cole from characters created by Stan Lee and Jack Kirby. The nation at the center of attention is Wakanda. The world largely ignores what is thought to be just another poor country in Africa. That's because its rulers have for centuries kept hidden from the outside world the fact that it is actually a technologically advanced civilization built from a rare and very powerful metal called vibranium. They rightly believe that if colonialists knew about it, they would invade to take it over. After all, Africa has been raped for its resources throughout history. A conflict over Wakanda mission and future drives a very involving storyline. 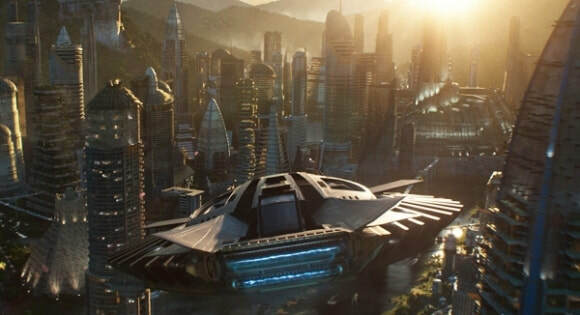 T'challa (Chadwick Boseman) returns from the United States to Wakanda upon the death of his father to take his place as king. His mother (Angela Bassett) assures him he is ready for this role because he is a "good man with a good heart." His little sister (Letitia Wright), a scientist and tech inventor (think M in the James Bond movies) has all the tools he needs to succeed. An immediate challenge comes from Nakia (Lupita Nyong'o), the love of his life who has been working as a spy in the outside world. She wants him to commit to helping the poor and disadvantaged with Wakanda's riches. He soon faces two other challenges to his beliefs about Wakanda's role in the world. He learns that Ulysses Klaue (Andy Serkis) has gotten a sample of vibranium, which he is about to sell on the international arms market, despite the efforts of CIA agent Everett Ross (Martin Freeman). And Erik Killmonger (Michael B. Jordan) arrives, carrying with him a claim to the throne and all the anger, resentment, and scars resulting from living on the margins of American society. He wants to arm black people with vibranium weapons so they can overthrow their oppressors. To make it all more difficult, T'challa realizes this young man is a monster of his family's own making. Because this is, after all, a Marvel Cinematic Universe film, there are plenty of fights, car chases, rocket-bearing planes, and other combat scenes. Perhaps the scariest are two physical challenges to the king fought in a pond on the edge of a waterfall cliff. What makes Black Panther different from other Marvel films is the attention to details of telling a story, the development of characters who are conflicted and unpredictable, and its exploration of issues that have contemporary relevance. This is more than a good-versus-evil flick. You may come away from it reveling in the outcome of the battles, but you will also find yourself thinking about what it means to choose peace and service of the poor.